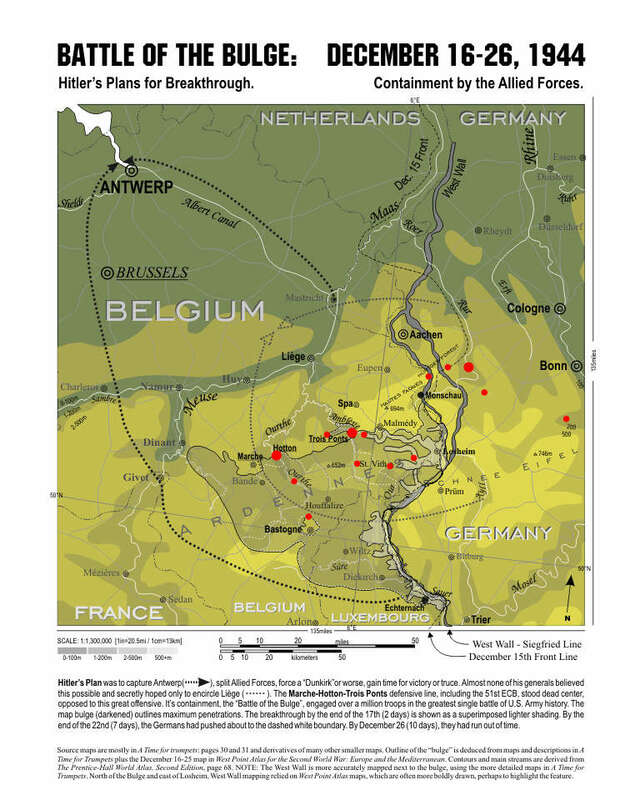 Hitler’s Plan: capture Antwerp, split Allied Forces, force a “Dunkirk”or worse, gain time for victory or truce. Almost none of his generals believed this possible and secretly hoped only to encircle Liège. The 51st ECB, stood dead center, opposed to this great offensive. It’s containment, the “Battle of the Bulge”, engaged over a million troops in the greatest single battle of U.S. Army history. The map bulge (darkened) outlines maximum penetrations. The breakthrough by the end of the 17th (2 days) is shown as a superimposed lighter shading. By the end of the 22nd (7 days), the Germans had pushed about to the dashed white boundary. By December 26 (10 days), they had run out of time. Click RED DOTS to pop up photographs. Close each window before trying another!